Parkinson’s disease is a challenging issue, and if your parent is dealing with this progressive disease, it is important that you are aware of the various symptoms and issues that they might face so that you can help them get through it in the best way possible. One symptom of Parkinson’s disease that is often misunderstood is freezing. This symptom is exactly what it sounds like: a sudden, unexpected, and involuntary inability to move. The freezing can impact any part of your aging parent’s body and can happen at any time. They may seem like they are perfectly fine one minute and then suddenly realize that they are unable to walk, feeling as though their feet are glued to the floor, or they may be unable to get up from the couch. Approximately 38 percent of falls that occur among those with Parkinson’s disease are related to freezing episodes. This can be a frightening experience and because the cause behind it is unknown, it is not something that your parent can treat directly. Reassure them. Anxiety and fear are likely to make the freezing episode worse. Reassure them that everything is fine and that you are there for them. Offer your physical assistance if they feel like they might be in danger or simply be there with them until the freeze wears off so that they feel less alone and frightened. Do not force them. You might think that it is helpful to “guide” your parent in moving, but any type of force such as this can increase the chances of a dangerous fall. If your parent feels ready to try to move, be there to offer help, but do not try to use your body to force theirs to move. Give them a focus. Sometimes it can seem like thinking too much about not being able to move properly makes that inability to move even worse. Giving your parent a focus that creates a “goal” or a meaning behind the movement can help them to get over the freeze. For example, put a piece of tape on the floor in front of them to give them something to step over. This then takes the focus away from the actual movement and puts it on accomplishing the goal of getting to the other side of the tape. 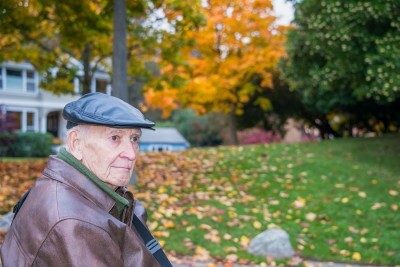 Hiring an elderly care provider for your aging parent can make a tremendous difference in their journey with Parkinson’s disease. This elderly health care services provider can be there to guide your parent through the progressive stages of the disease, helping them to address the changes in their symptoms as they arise. They can give your aging loved one the dedicated, personalized care that they need to live as independently as possible while also staying safe, healthy, and secure. This can be especially valuable if you live at a distance from your parent or do not have the physical capability to handle their hands-on care. The elderly care provider can step in to fill in these care gaps, creating a safer, more comfortable care experience for everyone involved. If you or an aging loved one are considering elderly care in Freehold Township, NJ, please contact the caring staff at Lares Home Care 1-800-781-7435 or 732-566-1112.